I’m losing faith in the Stath. Well, in his movie choices anyway. So what’s it all about, san? When a Las Vegas bodyguard (The Stath) with lethal skills and a gambling problem gets in trouble with the mob, he has one last play . . . and it’s all or nothing. I should have known what to expect when I saw the name Simon West pop up across the silver screen. At his best, Con Air! One of the most iconic action movies of all time! Why didn’t he put the bunny in the box? At his worst, Stolen. One of my worst films of 2013. Ironically both involving Nicolas Cage. West normally has the right balance of cheese with all out action. Silly but fun. 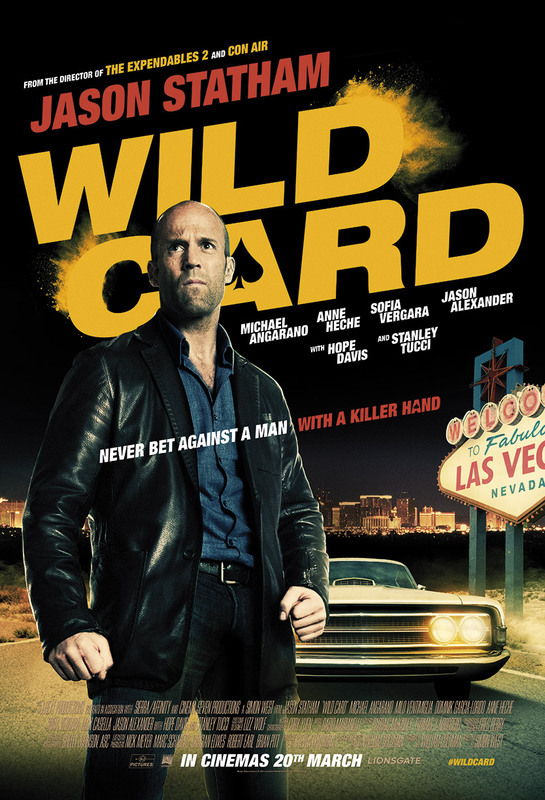 While Wild Card, on the other hand, was just terrible. My DISAPPOINTED Kevin Sorbo Hercules video doesn’t even come close to showing my frustration. A slow opening sequence involving Stath and a little “matchmaking” hustle with the alluring Sofia Vergara (Modern Family) was silly but easy going. For a minute, I thought it was going to be a little like Better Call Saul. They even had a similar office set up. Jason Alexander! Good old George Costanza as a Saul Goodman type showed all the potential. BUT oh no! All he did was introduce the Stath to Michael Angarano’s (Sky High) retarded tweenie gambler. Leading to an uneven, badly acted and badly written film that failed on everything BUT the violence (The little that there was). Okay, retarded was a little harsh. Angarano’s dweeby laugh and lead dialogue didn’t help me like his one-dimensional character. Meanwhile, a more interesting subplot seemed to be emerging as we see Dominik Garcia-Lorrido’s call girl battered, bludgeoned and dumped outside a hospital. However, before we get to find out the who, why and how? We have to drudge through mindless exposition and pointless sweeping night shots of the Stath driving around Las Vegas. The cinematography was outstanding. I must commend Shelly Johnson for making this mess worth looking at. Anne Heche and Hope Davis. Two talented actresses reduced to nothingy supporting roles. Heche as a waitress. Purpose? To serve the Stath some lemonade and give him a break from talking to himself. Davis as a card dealer. Purpose? To remind us that the Stath gambles. Go figure. I could tell that by the fact he was gambling! And if that wasn’t bad enough, I was fed up with listening to Angarano’s insecure rich boy desperately seeking a friend. However, we finally get back to Garcia-Lorrido. She seems to have inherited her actor father’s deadpan drawl. Yep, lifeless and dull. She tried to pull off the femme fatale vibe but she didn’t have the conviction. In between Stath’s babysitting subplot, we have a little vengeance ploy as his services are required to teach a harsh lesson to a deluded mafia monster. Well, I say monster. More like moper. Peter Petrelli? What happened? Milo Ventimiglia was such a whiney little nob. I couldn’t stand him. He played the douchebag mafioso well but he was just so irritating and pathetic. I could understand him being a quivering whimp in one scene as the Stath and Garcia-Lorido dispense some justice with his manhood and some garden shears but otherwise, he lacked the conviction to be taken seriously as a scumbag. It was such a shame considering the back story that Lorrido built up around him. The detail on what he did to her was gritty and gruesome. And then we see him and he’s an absolute plonker. The film kept changing in tone and flitting about. Ridiculously silly one moment, brooding and menacing the next. I wasn’t sure what it was trying to be. It failed anyway. I think the only reprieve for this film was the fight sequences. There weren’t enough but when the Stath did kick off, it was brutal, intense and brilliantly choreographed. One particular highlight involving Stath using a knife to jam up a hitman’s firing pin. To be honest, Stath deals with Ventimiglia too easily and we are left watching him gamble his life away. The gambling scene was ruthless, tense and probably the most suspenseful sequence in the whole film. 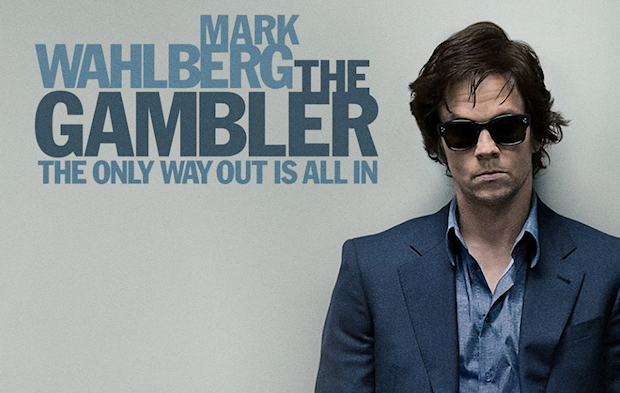 However, I expected more of this in the horrendous remake that was The Gambler. I’m sure Goldman was trying to make Wild Card a philosophical journey of one man’s decent but it was too pretentious, too hammy and just plain terrible. I mean Stanley Tucci? What was the point of his character? Donning another bad wig and smirking. With a look that said; “Am I really in this? Is this all they need me for?” A mediator for the mob who didn’t do any proper mediating and was only in the film for two minutes. Easy money for the Tuc. The frantic (and forced) fiery finale was manic, violent and everything I expected for the other 90-odd minutes. Stath does his best to make it watchable and nearly pulls it off. BUT he gambled on the wrong project. They didn’t even explain his knack for disposing of baddies by flicking cards. I’m not even going to get into the fact that it’s set during Christmas and was released in March. Too many questions, not enough action, story or character to keep me quiet, engaged or caring.